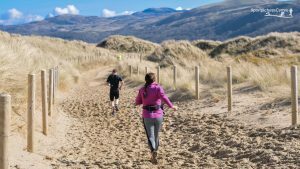 Stunning Weather and Competitive Racing for First Ever Always Aim High Harlech Race! | News by Wales Express News, People Before Profit! 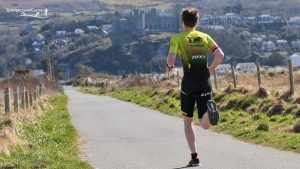 The first ever Harlech Triathlon & Duathlon organised by Always Aim High Events was greeted with stunning weather, an extremely high quality field of athletes and hundreds of enthusiastic supporters along the route. 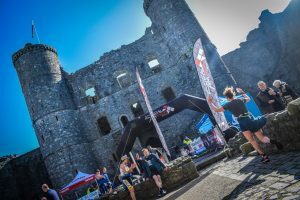 Minus temperatures overnight made way for glorious sunshine as the event kicked off with the triathlon, which was made up of a 400 metre pool swim, 21 km road cycle and a 6 km run, which is topped off with the ‘Storm the Castle’ section – a race to Harlech Castle along it’s mighty climb of 127 steps! 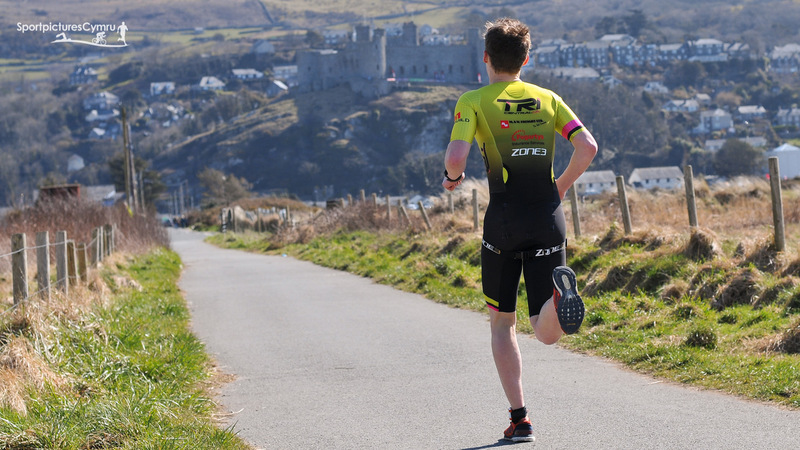 Now a Welsh sporting institution, and the perfect way to kick start the triathlon season, the Harlech Triathlon offers a thrilling course with close racing throughout the pack. 2018 was no different with the men’s top three separated by just under 4 minutes. Total Tri Training’s Chris Standidge took first place in the men’s race – 2 minutes ahead of second, while Helen Marshall finished first, comfortably ahead of second place Catherine Connell in second and Helen Mason in third. 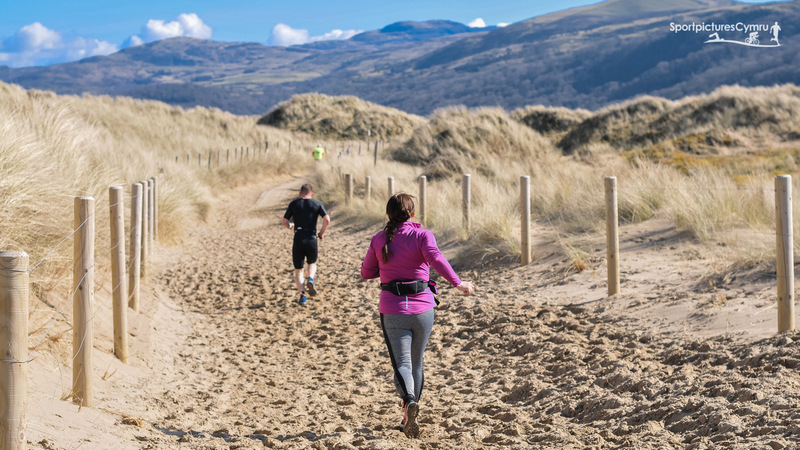 The Harlech Duathlon, which followed immediately after the triathlon, saw competitors tackle 5 km and 2.5 km runs, sandwiched between the same stunning 21 km road cycle as the tri. The duathlon competitors also had the ‘pleasure’ of the 127 steps to Harlech Castle before they could cross the finish line inside. Running at the same time as the overall duathlon race, Welsh Triathlons Duathlon National Championship decider saw home nation members race it out to be crowned champions. In a hugely competitive and local field, the men’s duathlon top three was also the Welsh National Championship, with Simon Cole of GOG Triathlon Club taking top spot ahead of Phillip Maddocks in second, and Pawl Hawkins in third. Completing a clean sweep for GOG Triathlon Club, the women’s duathlon (Welsh Duathlon Champion) winner was Rhian Roxburgh. Rhian completed the stunning course comfortable ahead of Sophie Horrocks in second and Rhian Thomas in third. In the Welsh Championship standings, Rhian was followed by Jasmine Bowyer in second and Emer Sandham (also from GOG Triathlon) in third. Snowdonia Slateman Triathlon 2016 selling out fast!